September is the time of the year when we welcome new children into our service. Here at Tigers, we want all children to feel welcome, to feel valued and respected as individuals and as a part of a wider community. Here at Tigers we believe in working in partnership with parents. We understand the important role each family has to play in our early years’ service. Here at Tigers we have a “Parents as Partners” policy. A positive partnership with parents helps promote and maintain a high standard of care practice. We invite our families to join us for “Bring your Parent to School Day”. This means that each parent is invited to join our preschool class for a morning session. They can be involved as much or as little as they like. They are invited to play with the children, read a short story with the group or share with us something from their home life or cultural background. Parental involvement has a valuable role to play in a child’s positive sense of Identity and belonging. On one such visit, one of the parents decided to share some information about where their family is from. 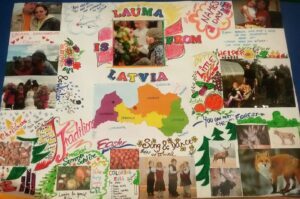 She designed this beautiful poster, including lots of personal and cultural information about her daughter, their family, their heritage, cultural traditions and much more. She performed a traditional Latvian dance and sang a song with her daughter, inviting other children to join in and get involved. The children loved this morning session and I could see how proud the little girl was, when her mom was joining in on all of the fun. Bring your parent to school day is a wonderful day, after each visit I reflect on the morning. After this particular morning I asked myself if other parents would be so enthusiastic to share such valuable rich information about their child’s family and background if given the opportunity. We decided to use the parent’s poster as our inspiration for a new project. “All about me” is a popular topic each September. When working with young children we want to get to know each individual child. 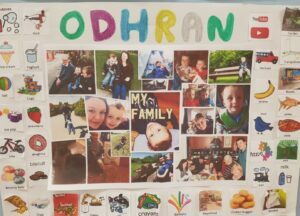 Creating a poster such as this is a great way to find out all about the child, from their favourite things, to their pets and extended family. We want to know all about the things that make each of us unique, so we asked parents to work on their very own poster with their child. See the rich detail that is shown in each individuals’ poster. The information we learn about each child is so valuable. 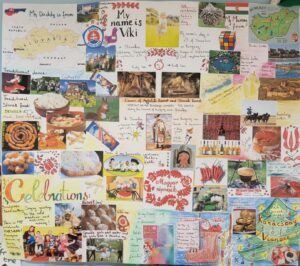 The children get to share this project with their families at home, bring it into the preschool environment and see their very own poster displayed in the preschool for all to see. We want all of the children who come to Tigers Childcare to feel valued, to feel respected as individuals, as part of a family and the wider community. We want the children to feel proud of who they are and where they come from. We want the children to feel they are capable, have opinions and views that are listened to on a daily basis.